Add style and luxury to your showroom and with a simple turn of a key show customers how their cover could be come an attractive gazebo. 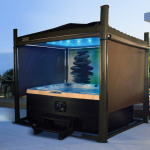 The Covana OASIS is not only a hot tub cover, it’s also an automated, state-of-the-art, easy-to-use gazebo, that’s designed for greater simplicity. Covana is innovative, versatile and compatible with multiple sizes of hot tub. For more information on how Covana could enhance your showroom, call Aqua Warehouse without delay.